At Unlocking Detention, we occasionally receive emails from people, including those who say they are journalists, asking us to let them join the “tour”. These requests stem from misunderstanding: some assume we are organizing physical, guided tours of the inside of these immigration detention centres, while we are actually running a “virtual” tour unearthing facts and voices from these centres. While their interest is welcome, it also makes us feel uneasy – what legitimizes our gaze inside these centres, when it is not for an official purpose of monitoring or supporting people inside the centres? 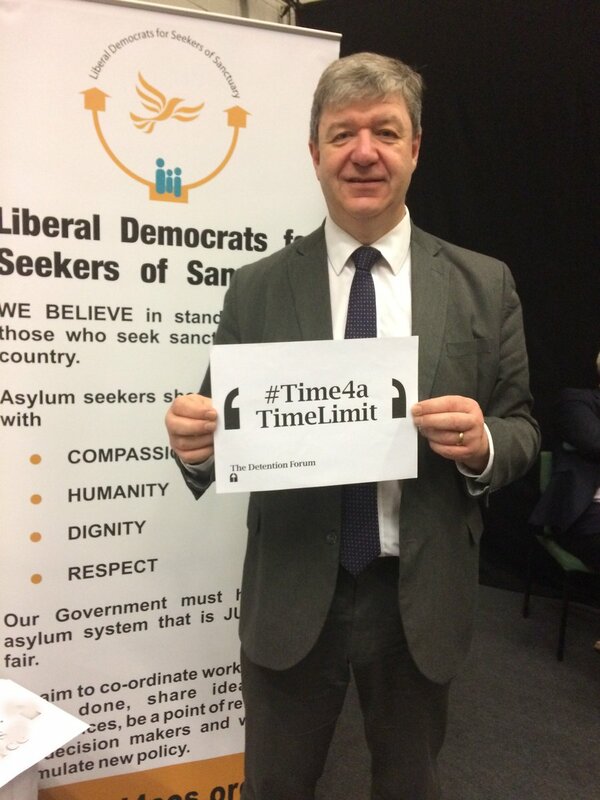 Should these centres be open for casual inspection by anyone who happens to be curious, knowing that people who are detained there are having a truly devastating time of their lives? When does this gaze transgress into the sphere of voyeurism? What makes us think that we can fully understand immigration detention through seeing its infrastructure? 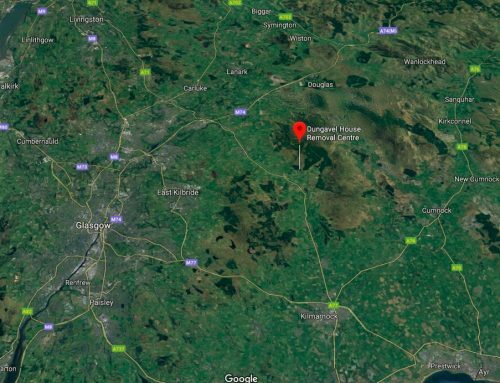 In this piece, Freed Voices members are our guides to the psycho-geography of detention centres, including Morton Hall which Unlocking Detention is visiting this week. The piece was originally published on Detention Action’s webpage here in 2016, in response to Unlocking Detention. Please do visit the original webpage which contains a full piece with more visual material. *The names of some Freed Voices members in this piece have been changed. 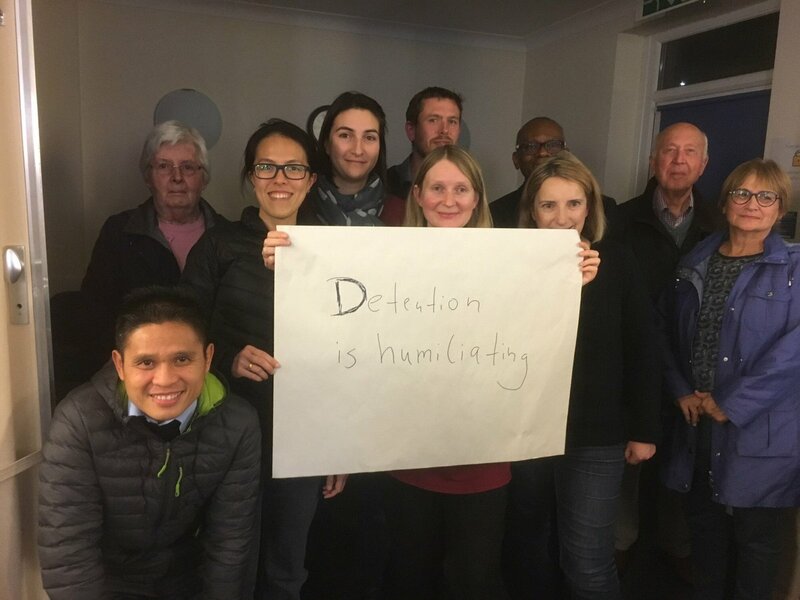 A few weeks ago, during the fallow days between Christmas and New Year’s Eve, the Freed Voices group met to reflect on a busy twelve months of campaigning and to mark the conclusion of ‘Unlocking Detention’ – Detention Forum’s annual, virtual tour of the UK’s detention estate. 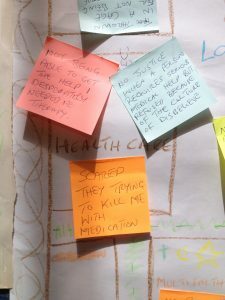 In homage to the latter – (which digitally ‘visited’ those sites of indefinite incarceration up and down the country that the Government would otherwise have you believe are ‘out of sight, out of mind’) – the group conducted their own exercise in ‘mapping detention’. 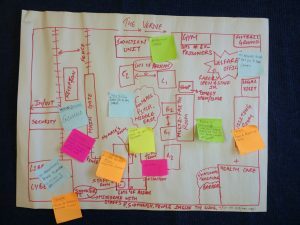 To begin with, they plotted the general outline of a detention-centre (most Freed Voices members have experienced several different IRCs so chose the detention centre which resonated most). 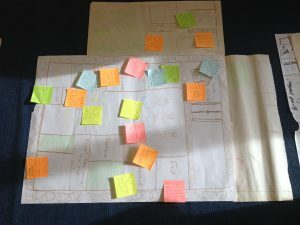 Then they filled in ‘key landmarks’, such as their rooms, healthcare, the canteen, visiting rooms, legal services, the shop, the yard, welfare and/or induction areas. 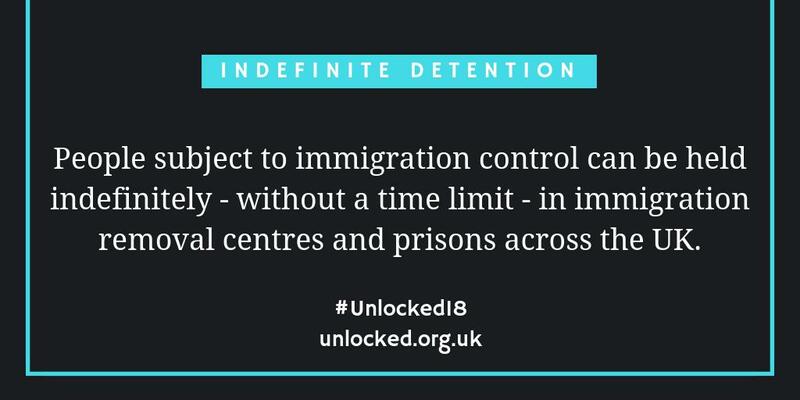 Next, Freed Voices members detailed the different demographics that might make up any given detention centre – where were the detention centre staff based? Where did new arrivals come in? Where were their friends in relation to their own rooms? Did different national or religious groups congregate in different spaces? Who dominated the yard? What was their typical movement through the detention centre on any given day? 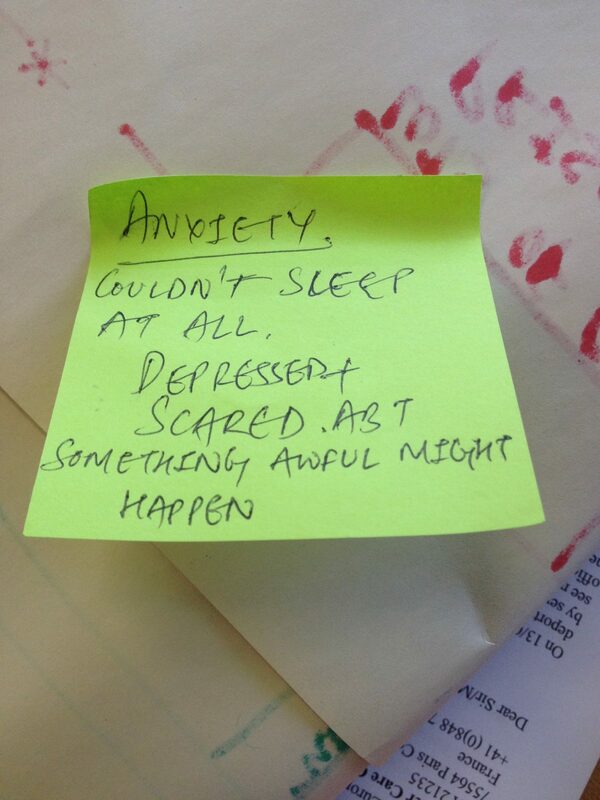 Lastly, they designed a post-it key, with different colours to represent different emotional states. 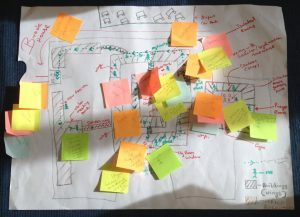 The group then pin-dropped these across their maps in different loci they associated most with that particular feeling. Feeding back to each other, and reflecting on their respective maps, several outstanding themes emerged. 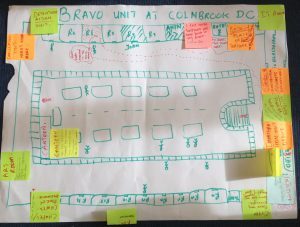 Firstly, the group acknowledged how they had (at least initially) all interpreted the exercise’s leading direction – ‘to draw the outline of the detention centre’ – very differently. Some members experienced greater freedom of movement throughout their incarceration and could detail the wider physical perimeters of the detention centre in great detail. All agreed, however, that this was equally applicable to their rooms – that the essence of detention boiled down to four brick walls, complete with one or two bunks, maybe a toilet, and more often than not a hermetically sealed window (occasionally with a birds-eye view of a nearby airport). Boone, who was detained for 7 months in Colnbrook, adjacent to Heathrow, said that ‘every minute and a half a plane flew past the window. Each one reminded me I was going to be deported back to my country. My room was my hell.” Omid said ‘my room was hopeless(ness)…I thought I never ever go out and that’s why in my nightmares I can see this room.” Shariff described his room as ‘My Coffin’. Second was the extent to which members described how their identities had been unmade, made and remade again whilst they had been detained. Almost all noted how their primary physical/emotional interaction with detention had been under the cloak of darkness, arriving in a blacked-out van, usually at around two or three in the morning, handcuffed, and marched through high-security gates like a criminal. John, who was predominately detained in Colnbrook, spoke about being stripped of the most important aspect of his identity: his humanity. He recounted how he had been spoken to like an animal, caged like an animal, and barked at by immigration officers like an animal – and not in a figurative sense, but with an actual guttural canine-growl. Freed Voices members largely agreed that the inevitable result of these kinds of experiences – the violence of segregation, the dehumanisation encouraged by staff, the deteriorating sense of self – was an intense distrust in everything around them. On one hand, this was directed at the individuals and systems that compounded their detention: Home Office-picked solicitors, the complaints system, welfare, healthcare staff. This dissolving of national identities was not the case for Michael, who has been based in the UK since he was 12, and who spent his two and a half years of detention exclusively in Morton Hall. Michael did note however, that some sense of self was salvaged whenever his partner – someone from outside Morton Hall’s walls – came to visit. Only then was he reminded who he was and what was normal. 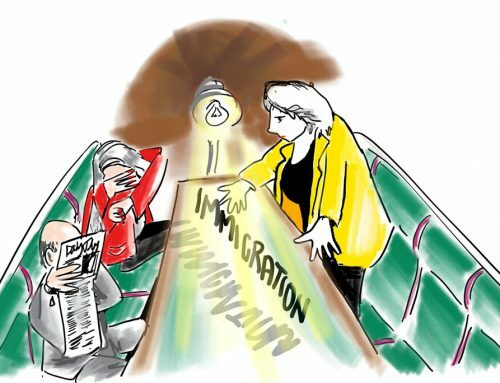 Others reiterated the vitality of visitor-groups, like the Gatwick Detainee Welfare Group, Detention Action or the Verne Visitors Group, who provided practical advice and support but also treated them ‘as individuals’. “We weren’t just numbers to them,” reflected Michael. Lastly (although perhaps unsurprisingly), was the omnipresent black cloud of indefinite detention. Fogging every other aspect of life in detention, the psychological impact of not-knowing when they would be released was the singular, outstanding theme Freed Voices members kept coming back to. ‘Torture’ was repeatedly used to express the horror of endless incarceration.